In a country where sand is everywhere the folding chair was considered one of the most important furniture in Ancient Egypt. Not only because it was transported around by the Egyptian army in campaign to be used by their officers mainly during the Middle Kingdom (2000-1630BC) as an easily portable camp seat and then became a kind of status symbol in many homes as a seat of dignity with elaborately inlaid decorations, but also because it was used before as a portable altar for spiritual and ceremonial purposes. What is interesting is that the artwork displayed in quite all the folding chairs made of a large variety of materials and styles, in cedar, ebony, leather or wicker, with ivory, gold decorative elements or silver animal-legged with papyrus side rails, lattices etc... it is always depicting for those who can understand, some major themes of the Egyptian spiritual high knowledge. The folding chair on the photo is from the Tomb of Tutankhamun, now in the Egyptian National Museum. 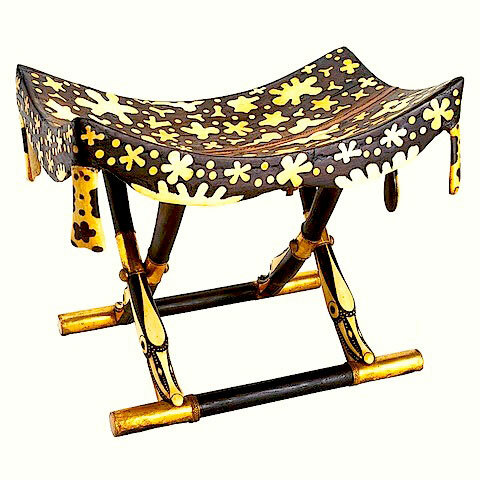 You can see on it a cow stylized skin and the stool legs are decorated with duck heads their mouth open to bite the horizontal bars that form the base and it is decorated with ebony inlaid and ivory.